Chastain was retained to perform a Phase I study and Phase II design of a 0.9 mile two lane section of South Country Club Road from US Route 36 to Lost Bridge Road. This section of roadway is a low speed meandering street which passes through Decatur Park District property, the Children’s Museum, the Decatur Zoo, residential homes, and the E. J. Muffley Grade School. This section also runs adjacent to Lake Decatur on the west. This roadway is heavily traveled and Macon County needed an improved and safer route. Chastain studied this section of roadway and analyzed the horizontal and vertical alignments of the roadway. A Project Development Report was completed including an Environmental Study Report, a Location Design Study (Rehabilitation), a Location Drainage Study, and an Intersection Design Study (IDS). Chastain also facilitated public involvement meetings to reach out to all the stakeholders and residents. Right-of-way and easement plats were completed for the land acquisition that was required to complete the project. Chastain completed Phase II final design plans and specifications. The new roadway is a two lane urban section with curb and gutter, storm sewer and intersection re-design, including a 10’ wide pedestrian path to improve safety. 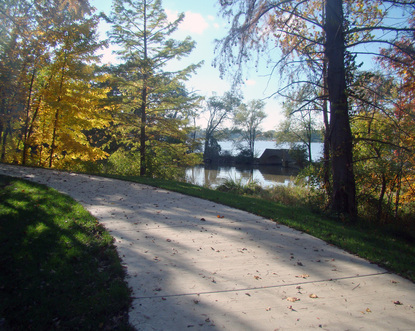 The path diverges from the roadway along Lake Decatur in some areas and through Decatur Park District property. The project required coordination with the FHWA and IDOT’s Bureau of Local Roads. The project was financed by federal and state funds, and was completed in 2013 for $2.9 million.